Ben Freeth is one of the farmers who lost everything during the land evictions in the early 2000s. “It was chaos all around and there was tremendous fear in the land. We were abducted and tortured and sadly my father-in-law was very badly beaten in the process and never recovered and later died.” He says memories of those brutal events are still fresh in his mind. Freeth became one of the most prominent activists among Zimbabwe’s white farmers. Many at the time were scared to act against the government, he remembers. But he, his family, and a small group of other farmers decided to sue the Zimbabwean government. When this failed, they turned to the judicial arm of the regional body, Southern African Development Community (SADC). The body’s regional court ordered Zimbabwe to return the confiscated lands and other properties back to the farmers. In response, Zimbabwe withdrew from the court and SADC immediately dissolved its judicial arm — a move that was attributed to the influence of former long-time ruler Robert Mugabe. The Zimbabwean farmers, however, think they still have a chance at making their claims. On behalf of 25 farmers, AfriForum, a South African non-governmental organization, which fights for the rights of the Afrikaans speaking community, has filed a lawsuit requesting compensation at the Pretoria High Court in South Africa. In December 2018, the South African Constitutional Court ruled that South Africa’s participation in dissolving the SADC Tribunal, under former President Jacob Zuma, was unlawful and unconstitutional. Lawyer Willie Spies says this is their basis for demanding compensation from South Africa. 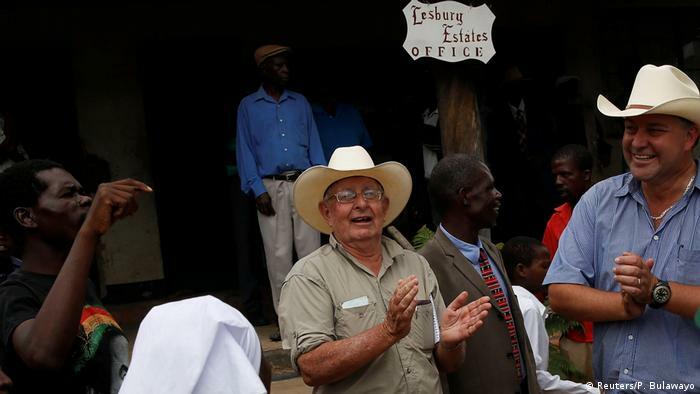 “Although it relates to the grabbing of farms in Zimbabwe, it relates to the further deprivation of the rights of people to access the court in order to enforce their rights,” Spies explains. The allocated amount, which the farmers’ representatives have for now accepted, is not enough to compensate all those who lost their land. “The new constitution of Zimbabwe which was approved in 2013 acknowledges the liability for compensation to farmers,” explains Zimbabwean economist Vince Musewe. In the current difficult economic mood in Zimbabwe, not everybody is happy about this, says Musewe. “Black Zimbabweans are angry,” says Musewe. “They say why should we compensate people who took land from us in the first place?” That’s why the government agreed to compensate for the infrastructure development that was destroyed and taken over, but not the land.